SILVER: With the commodity continuing to hold on to its bullish offensive following its recovery triggered off the 14.38 level, further price extension is envisaged. 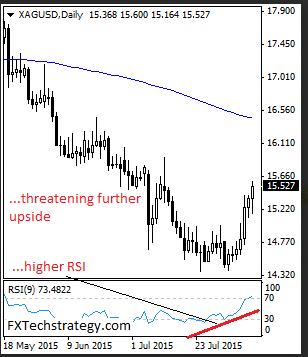 Resistance resides at the 15.70 level where a break will turn attention to the 15.90 level. A cut through here will open the door for a move higher towards the 16.20 level. Further out, the 16.00 level comes in as the upside objective. Its daily RSI is bullish and pointing higher suggesting further strength. Conversely, support lies at the 15.30 level and if broken it could weaken further towards the 15.00 level where a break will aim at the 14.80 level followed by the 14.60 level and subsequently the 14.40 level. All in all, Silver now looks to strengthen further.